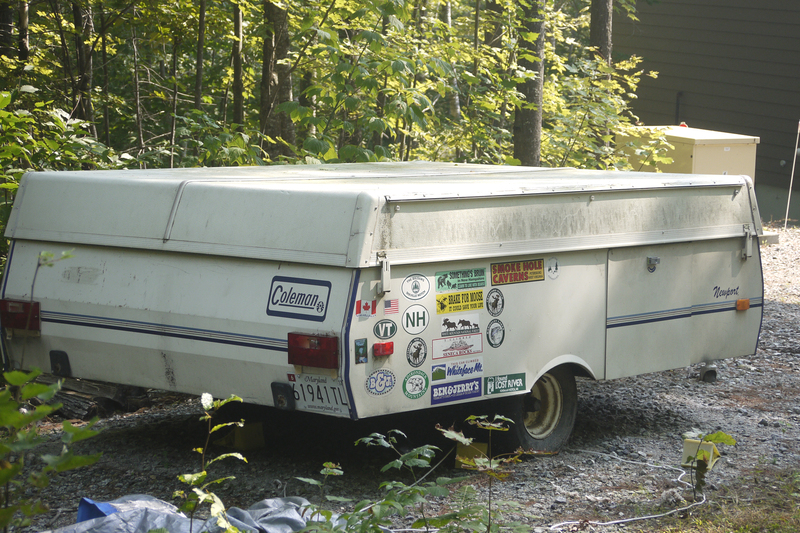 This week we had to say good-bye, forever, to our beloved 1989 Coleman Newport pop-up camper. We had camped in tents when we lived in California 30+ years ago, but when me moved East we realized that camping in tents was not very practical due to summer thunderstorms and high humidity. When the kids were small, those middle-of-the-night thunderstorms were part of the adventure. Before any camping trip, I made sure to check out dozens of age-appropriate books from the library, and bring along plenty of flashlights with large packages of fresh batteries. Inevitably, sometime between 2 and 4 a.m., there would be a thunderstorm. If they weren’t awake already from the loud booms and dramatic flashes of light, I’d rouse the kids from their sleeping bags, and we’d all go into the car to wait out the storm. It’s dangerous to be in a tent, on the ground, during a thunderstorm, due to possible lightning hits. So there, in the car, they’d cozy up in the darkness to their books and flashlights, and read until the storm passed. When the storm cleared, we’d walk through the muddy ground to the tents, inspecting them for leaks and damp sleeping bags. If the following day would be sunny, we’d simply hang the damp bags on an improvised clothesline strung between two trees until they’d dry out, usually in a couple of hours. But after a really long downpour, or if the next day’s weather called for cold or cloudy conditions, it meant that the next morning, instead of a planned hike, our activity would be laundromat-bound, where we’d dry the bags in commercial dryers so we would have a comfortable night’s sleep. Even if there was no call for more rain, the high degree of humidity in the east coast air meant that things were unlikely to get truly dry, and then mildew would ensue. When we began spending more time at the laundromat than the mountaintop, we realized that tent camping was no longer a viable option, so we bought a used pop-up trailer. Oh, the adventures we had! 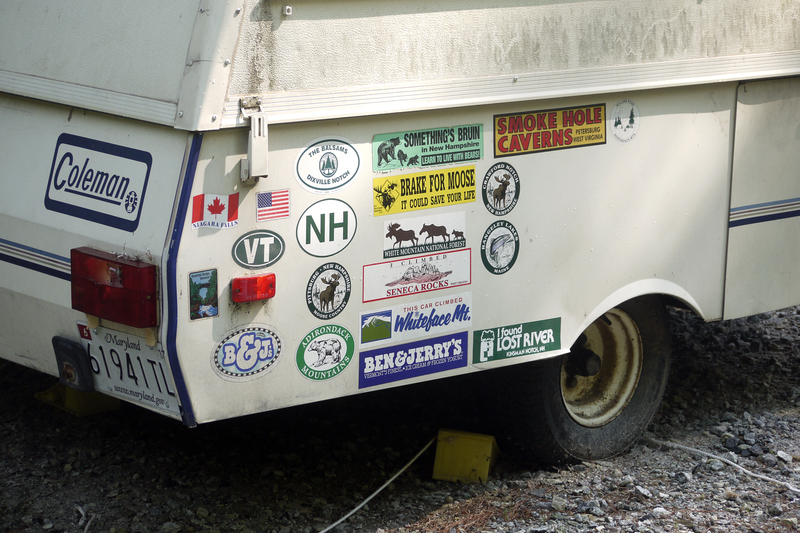 Wherever we’d go we’d put a bumper sticker from that place on the camper, and our little pop-up was a visual travelogue. In retrospect, it would seem that our children did not share their parents’ enthusiasm. Perhaps they were traumatized by pit toilets or the strenuous hiking, but as adults, none of them enjoy camping, and their idea of a vacation is a 5-star hotel. Feh! It is perhaps my biggest failure as a parent (although undoubtedly my children can think of much more grievous reasons that my parenting was less than stellar), but I am genuinely saddened by my inability to transmit my enjoyment of camping and natural wonders to my children. A couple of years ago, four of my grandsons decided to spend a night in our camper (which is parked on our property) when they came to visit us in Maine. One by one, throughout the night, they ended up inside the house: wild animal noises had scared them. (Unless you know what it is you are hearing, the noises can be very disconcerting. For example, the sound foxes make when they are calling to one another sounds like a baby is being murdered.) To solve this problem in the future, I ended up finding sound files on the Internet of the various animals that frequent our woods. Once they knew what they were hearing and that they were not destined to be that night’s dinner, the grandkids were able to relax a bit. But that was probably the last time our camper was ever used. The truth is, since moving to the White Mountains, I have had no real desire to go camping. The multiple places in the past that we had to drive 10 hours to visit and go camping are now within an hour’s drive, so the many hikes we took are simply day trips for us now. If I want to experience a nap outdoors, I can go on my screen porch and lay on the futon, or string our hammock (with built-in mosquito netting) between the trees. Thanks to a project I assigned to my grandsons on their last visit, we now have a respectable fire pit (basically just a circle of large rocks and small boulders set on gravel) for campfires and outdoor grilling whenever the mood strikes. I guess it’s a sign of getting older, and having had the privilege of already camping in places I wanted to experience, such as the Grand Tetons, the Sierras and the Rocky Mountains, but I have no real desire to travel elsewhere anymore. (The one exception: I still want to visit Glacier National Park some day.) I expect that the only real traveling I will be doing in the future will be in my visits to Israel, and occasional visits to California to visit the graves of our parents. When four of our grandsons came to visit us in Maine last week, they expressed a desire to go camping one night. We had a wonderful campsite picked out that is located only 3 miles from our home, alongside a stream with natural swimming holes. But when he went to open up the camper to fill it with supplies, my husband was met with the unbearable stench of mildew and decay. Cranking it open further, his eyes widened: swatches of grey fur, 1′ high piles of mouse droppings, and shredded material everywhere. Hundreds of mice had eaten their way into the camper, where they had nested throughout the winter. They had lived there, raised broods there, partied there, and died there. The multiple mouse holes had allowed water to get in, and the leaks resulted in mold. There was not a square inch of the camper that had not suffered damage: the canvas walls, the floor, the foam mattresses, the wiring, the cabinets – – all completely destroyed by gnawing, shredding, defecation, mold, mildew, death and decay. 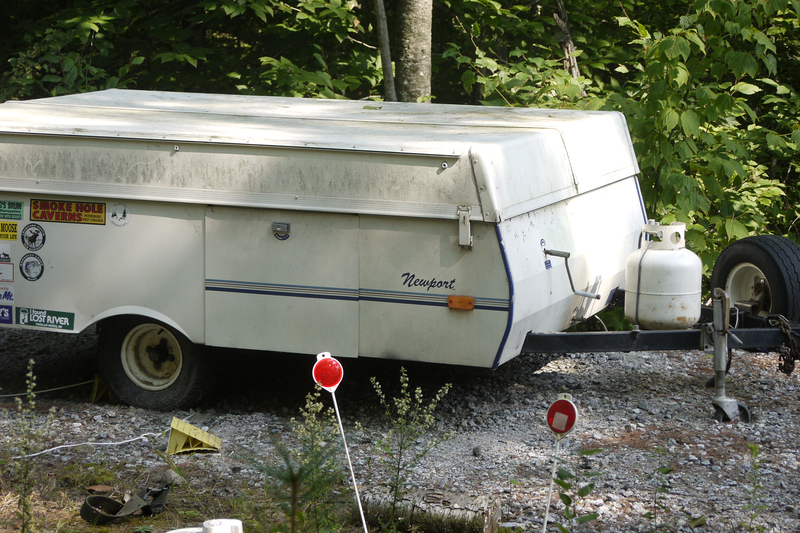 Even before the mice attacked, our camper wasn’t worth much, monetarily speaking. Due to its disuse and taking up a lot of space, we had actually thought of trying to get a couple hundred bucks for it on Craigslist, but sentimentality had prevented me from selling it. Due to its age, certain things had already started falling apart and some parts of its interior were literally held together by duct tape. But it still worked! And oh, the memories! That said, I wasn’t overly upset by its demise, although I can’t say I’m thrilled by the cleanup. I had to buy hazmat masks against the odor, and latex gloves. In the end, I wimped out, and I played the “helpless woman” card. Which is weird because I’ve gotten used to impaling live wiggly worms on fish hooks. But I just couldn’t do this job of sorting through the camper, so finding salvageable items became my beleaguered husband’s job. I would have taken it to the dump as is, but we needed to empty out the many cupboards and storage areas to see if anything was salvageable. And this being Maine, nothing goes to waste, not even a mouse-eaten camper. Someone will claim it, deconstruct and remove the interior down to its bare bones, and use it as a flat-bed trailer to haul wood or a tractor. So our little camper will continue to be of service, although not in the capacity for which it was originally intended. We won’t be buying another camper to replace it, so I guess it’s an end of an era. But oh, the memories! I am so grateful for the many good times we were blessed to experience with our little ’89 Coleman pop-up trailer. This item was recently listed on ebay as “Unique Vintage Navajo Moose Sterling Silver Pendant.” It’s unique, all right. And you can’t even use the antlers as a shofar. Click on this link and scroll down to view. 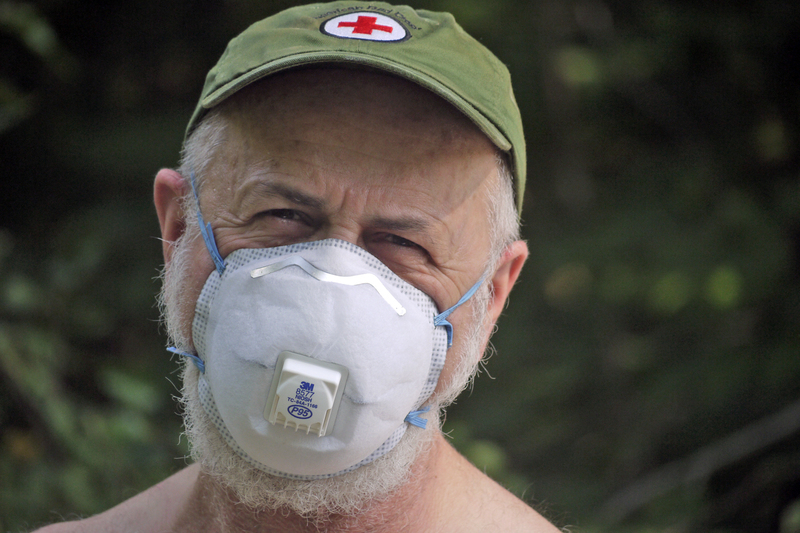 One of Maine’s modern-day folk heroes is a man by the name of Donn Fendler. Way back in 1939 when Mr. Fendler was only 12 years old, he became separated from his family on a hike while descending Maine’s tallest and most challenging mountain, Mt. Katahdin. Hundreds of volunteers, rangers, and the National Guard, plus trained dogs and airplanes, joined the search to look for him. After two days, the search was deemed a recovery mission because no one believed he could have survived the extreme conditions on that mountain. Mothers all over America sent prayers via telegram (“They did that in those days,” said Mr. Fendler). After seven days, only a few searchers remained. Miraculously on his own, after nine days, Donn Fendler walked out of the woods and made his way to a rustic cabin that was fortunately inhabited at the time, and he was rescued. He weighed 74 lbs at the start of his adventure and 58 lbs nine days later. Only a couple of days into his wanderings he had lost his shoes (which had been torn to shreds by sharp rocks) and his jeans (which had been soaked by rain, sleet, and streams). Although he had multiple abrasions, sunburn, and was covered head-to-toe in bug bites, and the only thing he had consumed was water from streams and some wild strawberries he’d found along the way, he was in remarkably good condition despite his ordeal. From the point where he got lost until the cabin where he was found is a distance of 48 miles – as the crow flies. It is estimated that he traveled between two to three times that distance in his wanderings while looking for someone to save him. Donn Fendler credited two things for his survival: his Boy Scout training, which besides some basic wilderness skills, taught him to “keep his head;” and more significantly, his belief in G0d. During his ordeal he prayed daily, sometimes for lengthy periods. He prayed for four things: that God should not let his parents worry too much; that G0d take care of his surviving siblings; he prayed for food, and he prayed that someone should come and rescue him. He later recounted his story to author Joseph Egan, whose book, told in Donn Fendler’s voice, is required reading even to this day for every school child in Maine. It is called “Lost on a Mountain in Maine” and I highly recommend it! It’s appropriate for children ages 10 – 13, but it will also leave adults spellbound. It is a great book for reading aloud. After his rescue President Franklin D. Roosevelt presented him with the Army & Navy Legion of Valor’s annual medal for outstanding youth hero of 1939. Donn was feted with a parade in his honor, and featured in an article in Life Magazine. Even though Mr. Fendler is now 85 years old, he still visits schools all around Maine every year to retell his remarkable story. Driving down a rural road on Rte. 117, we came across this side street. 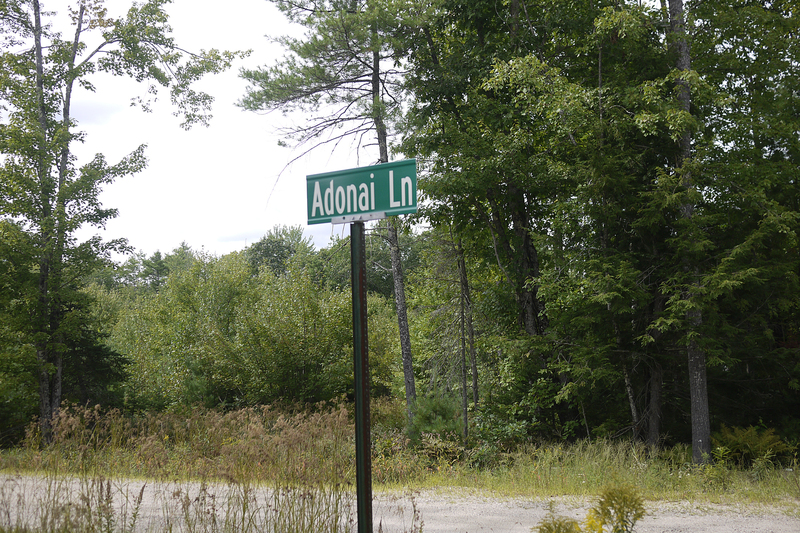 We’ve heard Maine called “G-d’s Country” before, and now we’ve found the street He lives on!